Ink Master isn’t ending anytime soon. Today, Paramount Network announced they’ve renewed the TV show for an 11th season. Currently in its 10th season, the competition show “puts artists through a series of tattoo challenges that not only test the artists’ technical skills, but also their on-the-spot creativity, as they must create and execute an original tattoo on a ‘human canvas.’” Judges include Oliver Peck, Dave Navarro, and Chris Nuñez. Nbew York, NY, April 24, 2018 – Paramount Network has greenlit a new season of the highly rated hit original tattoo-competition series, “Ink Master.” Season 11 will consist of 16 one-hour episodes. The announcement was made today by Chachi Senior, Senior Vice President, Original Programming, Paramount Network. “Ink Master” is produced by Truly Original. “Ink Master” is currently in its 10th season and still a ratings powerhouse – ranking #1 with Adults 18-49 and Women 18-49 timeslot on cable. “Ink Master” will crown its latest winner at the Season 10 finale on Tuesday, April 24. In addition, “Ink Master” spin-off series “Ink Master: Angels” is currently in its second season. Each week “Ink Master” puts artists through a series of tattoo challenges that not only test the artists’ technical skills, but also their on-the-spot creativity, as they must create and execute an original tattoo on a “human canvas.” Each episode focuses on a different and distinct style of tattooing such as realism, black and gray, and American traditional. The masterpieces the artists create will last a lifetime – and so will their mistakes. After every challenge, the contestants face a tough panel made up of series host Dave Navarro and world renowned tattoo artists Chris Nunez (“Miami Ink”) and Oliver Peck (Elm Street Tattoo). “Ink Master” and “Ink Master Angels” are produced for Paramount Network by Truly Original (“Swamp People,” “The Real Housewives of Atlanta,” “Vanity Fair Confidential”) with Glenda Hersh, Steven Weinstock and Andrea Richter serving as executive producers. Truly Original is a subsidiary of Endemol Shine North America. What do you think? Do you watch Ink Master? Are you glad it’s coming back? 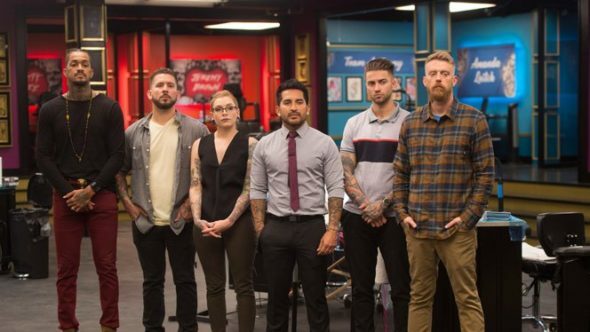 More about: Ink Master, Ink Master: canceled or renewed?, Paramount Network TV shows: canceled or renewed?